My favorite way to cook fresh seafood is to cook it simply with just a few ingredients. These clams are delicious, and combined with a loaf of crusty bread and a crisp green salad they can be made into a complete meal. You can also serve 6 as an appetizer. Clams are surprisingly high in iron, and a good source of omega-3 fatty acids. A light healthy seafood appetizer. 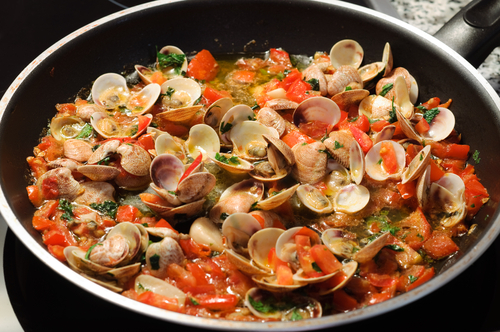 Soak the clams in lightly salted cold water in the refrigerator for 2 hours, then drain. Heat the olive oil in a heavy saucepan and add the garlic and onion. Cook over medium heat until soft and fragrant, then add the wine, tomatoes, salt, pepper, and pepper flakes and bring to a boil. Add the clams and cover, and cook until the clams open, about 5 minutes. With a slotted spoon, remove the clams and keep warm. Boil the tomato mixture until reduced by half, add the parsley and mix well. Place the garlic toast into individual shallow bowls and divide the clams into each. Pour the sauce over the clams and serve immediately.